Someone has removed the center bars on two of the mines with a blow torch, making my exploration easier. Looking out from the main tunnel. This mine measures about 176 feet and is filled with old wood scraps. This is one of those mines I have very little background information on. Apparently it was a fairly recent mining operation which was probably operational from the late 1920s through the 1930s, but this has not yet been confirmed. 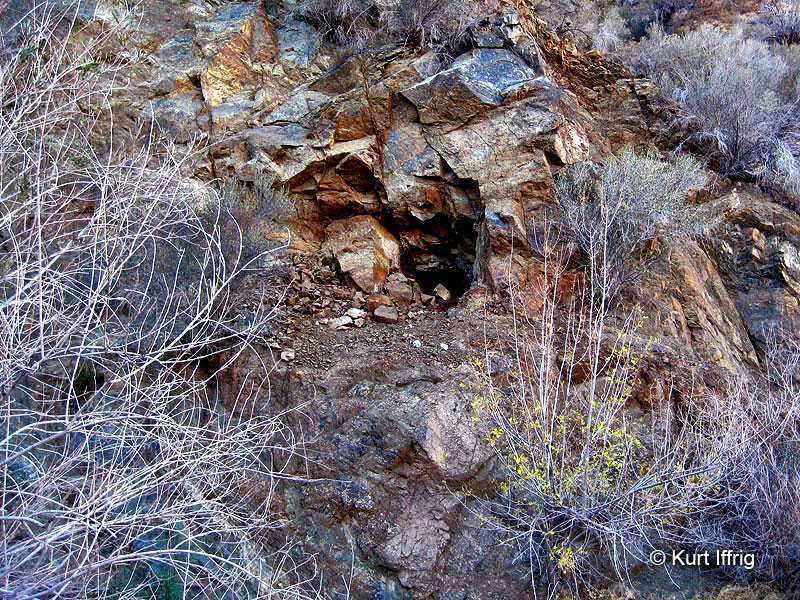 What I do know so far is that Bear Canyon saw both placering and lode mining. The scarce information I’ve gathered tells me the mine used a “postage stamp” mill (two stamps) or a “coffee pot” mill (single stamp mill) to crush their ore. That’s about all I can tell you about this mine so far. If you have any additional information about this mine, please leave me a message at the bottom of this page. Looking out from the back of the main tunnel. While I was inside I found a beautiful quartz crystal. Bear Canyon is an offshoot of Soledad Canyon that follows the Santa Clara River and then drifts off into the San Gabriel Mountains. The mines are in an area called the Soledad Canyon Narrows, very near to the old Southern Pacific Railroad, which now serves the Metrolink. 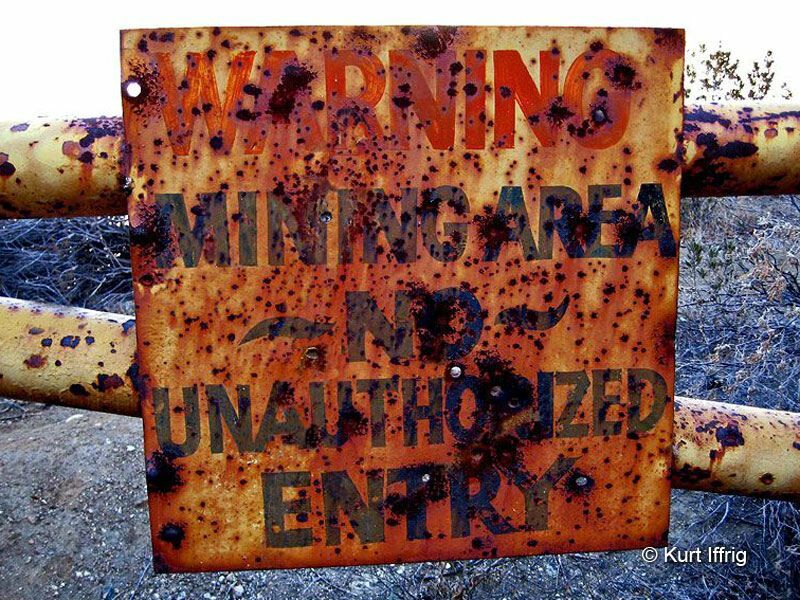 The mines are in a sketchy area, a place where the Sopranos would probably go to dump bodies. In fact, on the day I visited, I hiked to the top of the mountain above the mines and watched somebody dumping what was probably a stolen car in the brush off a dirt road near the streambed. I witness a lot of unusual events on these mining explorations. There is one main tunnel, approximately 176 feet deep, and two other (unmeasured ) shallower mines on the hillside to the right. In addition there is a very shallow indent to right of the others. This appears to have been a small exploratory endeavor that didn't pan out. The main tunnel is very easy to spot, the other three take a little bit of searching. Two of the mines are gated, but the center bar has been removed from both, so access is easy. These mines probably don't have specific names, but I call this one Tunnel #2, the second in a line of four. The second tunnel is up on a hillside, and is fairly easy to spot. It too has an iron gate with the center bar missing. The portal has been partially filled in, but entry is not a problem. 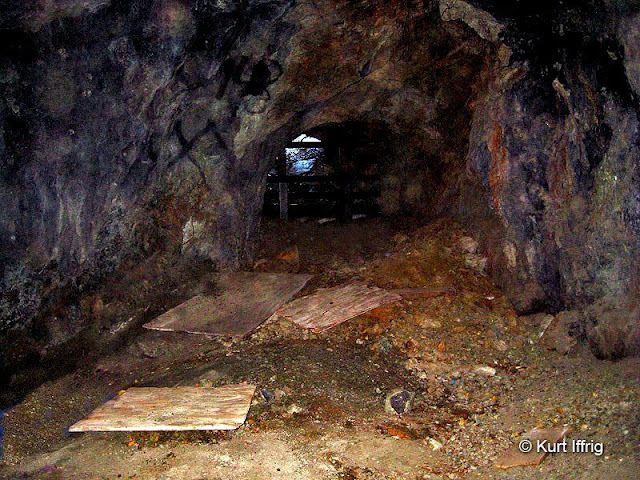 Inside is a wide, hollowed out area, with plywood similar to the wood scraps found in the main tunnel. I did not measure the inside of the number two and three tunnels. From the photo below I would estimate it's between 30 and 40 feet deep. Inside Tunnel #2. Like the main tunnel there are wooden boards and plywood scattered throughout. Tunnel #3 is the hardest one to spot. You need to stand at the right angle in order to see it. This one does not have a gate and is very shallow, less than 15 feet deep. the portal has narrowed over the years, but access is still fairly easy. Tunnel #3 is pictured below. Tunnel #3 is tough to spot from the streambed and it's somewhat challenging to climb up to. 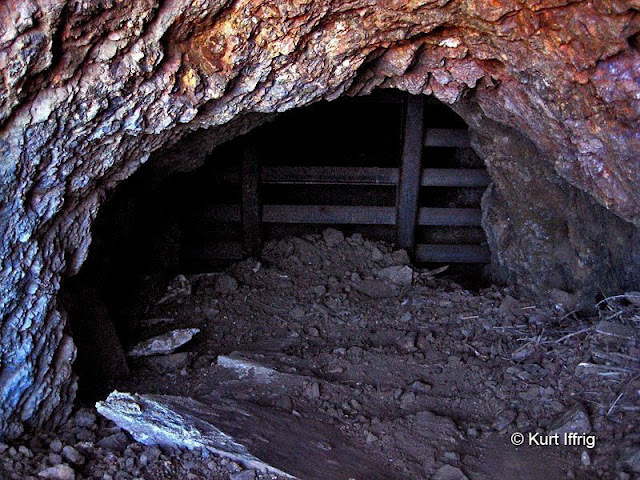 These mines are some of the easiest of all the ones I’ve visited to get to, meaning the shortest hike. They are less than 1/8 of a mile from the road I parked next to. According to the scarce information I’ve gathered so far these were probably mined during the Great Depression, and the nearby railroad almost certainly played a part in the transportation of ore. These were all gold mines, however the success of this operation is unknown. Looking out from Tunnel #3. This one has filled with sediment and narrowed over the years. Tunnel #4 looks like the beginning of an exploratory mine that was quickly abandoned. You can see a photo of it below. I find these sort of mines regularly. It’s a challenge to climb up to this one, but I would estimate it’s only four feet deep. Most people who have been here don’t count it as a mine, but it’s definitely the beginning of a man-made exploratory tunnel. This is a fourth tunnel, but it only goes in for a few feet. Three of the four mines are up on the hillside. 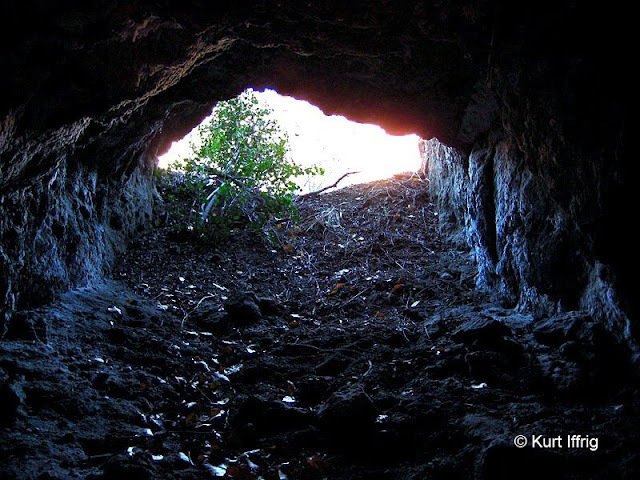 There are many different Bear Canyons in the San Gabriel Mountains, but this particular one has a story behind it. John Lang was a Soledad Canyon pioneer. According to “An Illustrated History of Los Angeles County, California” printed in 1889, on July 7, 1873 Lang was credited with single handedly killing the largest grizzly bear ever known, right in the upper reaches of this canyon. The bear supposedly weighed in at a monstrous 2,350 pounds, breaking a previous record by 750 pounds. However, Lang himself disputed the printed story in a letter to the editor, claiming that the bear actually weighed 1,600 pounds and that he was assisted by two other men. 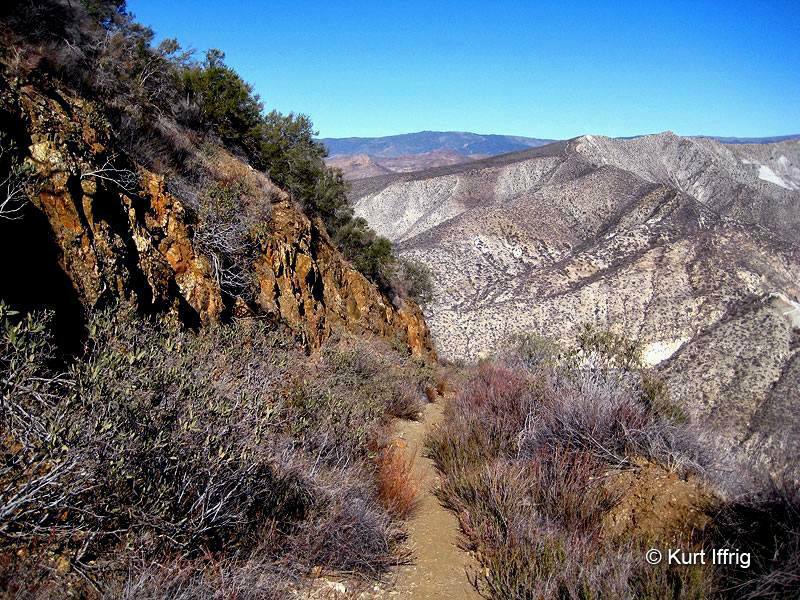 Once a mining road, the Magic Mountain Truck Trail has narrowed to a small, brushy path. 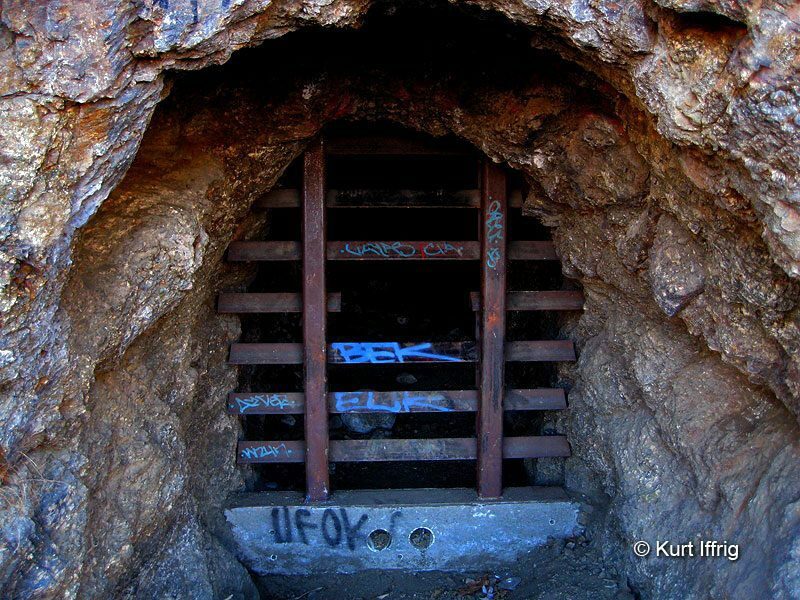 Next to the mine there's an old gated road with a rusty mining sign that takes you deep into the San Gabriel Mountains. Supposedly it leads to an actual mountain called "Magic Mountain". I think it's called the Magic Mountain Truck Trail, but I'm not 100% certain. Magic Mountain has a communication tower on top of it, but it's a long hike in. I walked this road, which turns into a trail for about an hour before I turned around. The views of Soledad Canyon were spectacular, but eventually it gets so steep there's not much point in continuing. The photo above was taken from the trail looking towards Newhall and Canyon Country. 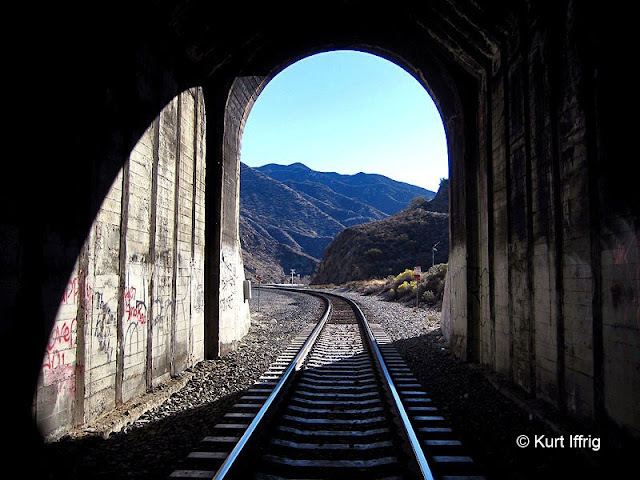 Tunnel #19 is 223 feet long and was completed on July 27, 1876. The entire rail was finished by September. 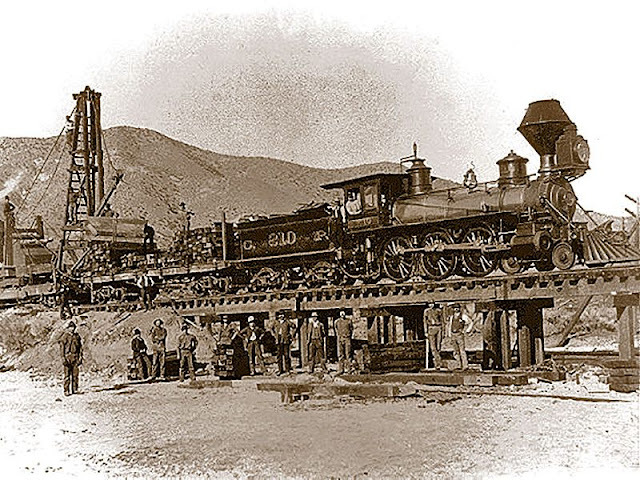 Prior to the construction of the Southern Pacific Railroad, transportation of ore and other goods throughout Soledad Canyon was limited to stagecoaches, wagons and mules. The terrain in some places was extremely mountainous, almost straight up and down through the San Fernando Pass, up San Francisco Canyon and over Tejon Pass. In 1875, just seven years after the completion of the Transcontinental Railroad, rail construction began in Soledad Canyon, linking L.A. to the north. Several tunnels were bored along the route, but the longest by far was the San Fernando Tunnel, a 6,940 foot expanse which took a year and a half to complete. Over 1,500 mostly Chinese laborers worked on the tunnel. Because of the sandstone composition of the mountain that was saturated with water and oil, frequent cave-ins occurred and the bore had to be constantly shored up by timbers during excavation. 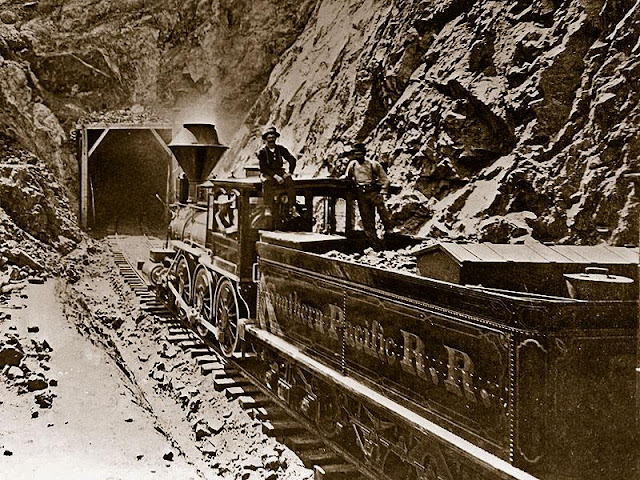 Southern Pacific train hauling ore through a tunnel along the Soledad route, possibly the Newhall Tunnel. 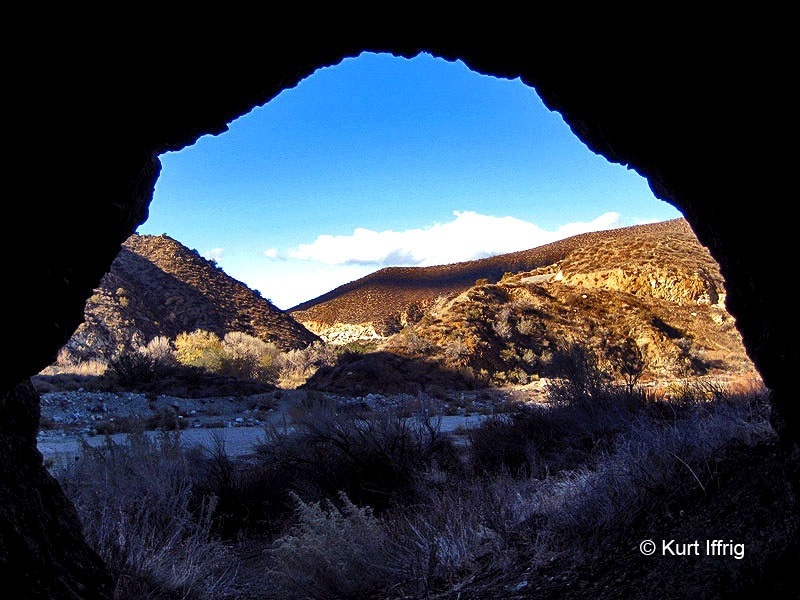 Initially the north end of the tunnel was near the Lyons Station Stagecoach Stop, but was abandoned due to frequent cave-ins caused by oil soaked rock. The northern end of the San Fernando tunnel was moved further west, near to current day Newhall. On July 14, 1876 workers digging north and south met in the middle. A number of Chinese workers lost their lives while digging this tunnel. At the time of its completion it was the third longest tunnel in the United States. Amazingly it was so well planned and surveyed that when the two sides met the bores from end to end were only out of alignment be a half inch. Track was laid and the first train passed through the tunnel on August 12, 1876. By September of that year, Southern Pacific was notified that the track had been completed from San Francisco to Los Angeles. Since then the tunnels have been upgraded, and the tracks now serve Metrolink. Should the bullet train ever be completed, it will also use this route between Sylmar and Palmdale. Surprisingly, nearby Acton was was once considered as a possible location for the California State Capitol. Workers off-loading railroad ties from Central Pacific Engine No. 210 near Acton. Circa mid-1870s. Great photos and info! 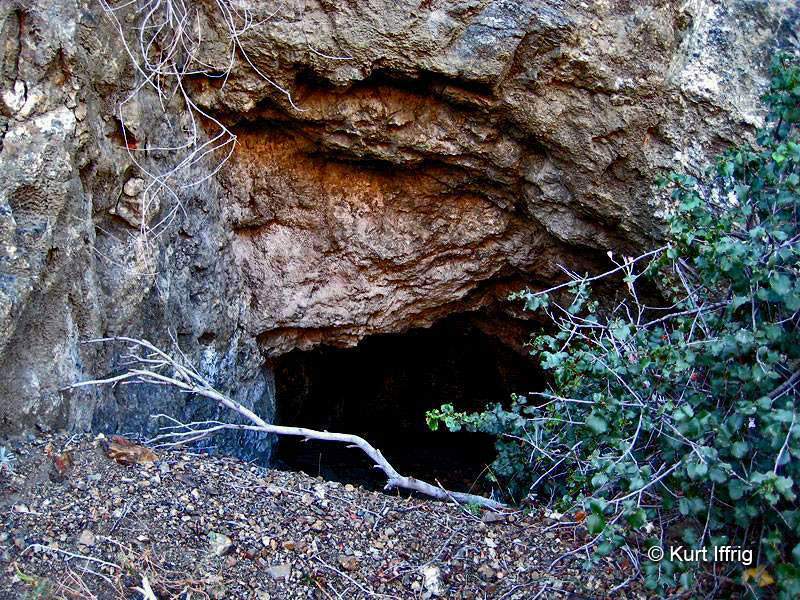 Have you explored the two further mines (and one exploratory tunnel) located approximated half a mile upstream of these? 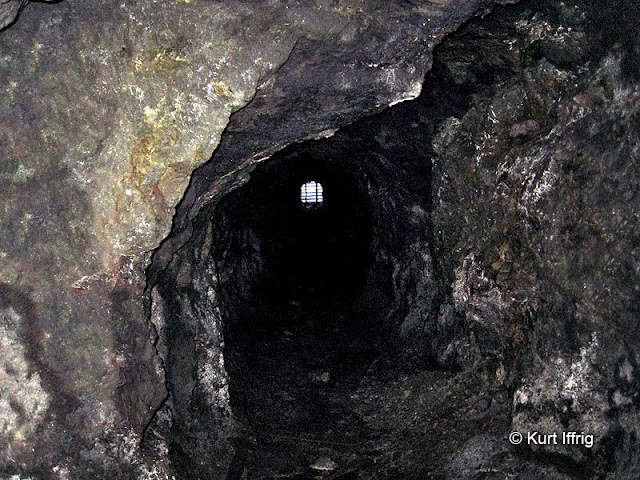 The two mines had been gated, but both have long ago been forced open. I hike past them frequently (I live nearby), but have never entered more than a few feet and would love to learn more about them. Thanks for the great tip Paul. I have not seen either. When you say upstream, would that be upstream of the railroad tunnel? If so I'll try to take some photos.